For Cisco Telepresence SX20, SX80 or C-Series codecs; compatible with RoboSHOT 12 HDMI and RoboSHOT 30 HDMI cameras. 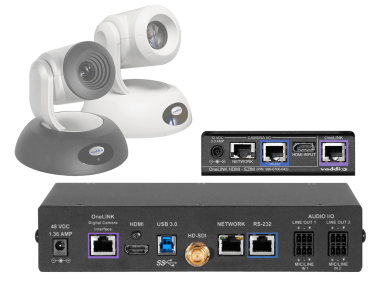 Use the camera you want: OneLINK Bridge gives you the flexibility to pair a Vaddio camera with your Cisco codec. Sounds complicated - but it's not. Tailored for Cisco codec systems and compatible with RoboSHOT HDMI cameras, this OneLINK Bridge kit simplifies installation by extending power, video and control to your camera over a single Cat-5e cable up to 328 ft (100m). When connecting a Cisco SX20 codec to a OneLINK Bridge, you will need to provide a Cisco CAB-PHD4XS2-SPLIT cable.